Our team will take care that your stay in the hotel be enjoyable and fruitful and will be only too glad to fulfill every wish of yours. The hotel complex “IRIS” combines architecture, luxury and elegance. The personnel look after the guests at any time to guarantee unforgettable days and pleasant surprises.Offering excellent food and services, comfortable and modern service, the hotel “IRIS” is the perfect choice for a vacation of families with children, groups and couples. 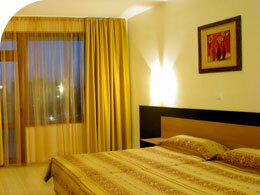 Hotel "IRIS" offers to its guests accommodation in 65 rooms and 11 apartments, which are cozy and with modern furniture. 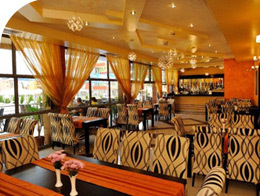 The restaurant, in nice surrounding, offers you to enjoy various Bulgarian traditional and international cuisines. The complex offers for your comfort an external jakuzi for 8 persons and a Finnish sauna. 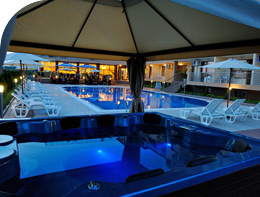 For your enjoyable mood the hotel offers fitness hall, table tennis and billiards.